After countless hours of wrestling with software I have finally managed to convert the frequency tones into sheet music! What I have created is, of course, a rough draft and only phase one of the general scope of the project. Currently, all of the notes are the same length (eighth notes) in a 4/4 time signature meaning that there are four beats per measure and each quarter note gets a beat. Because to the human ear 255.32924 Hz and 255.27043 Hz are indistinguishable these two frequencies in series show up on the sheet music as not two eighth notes but one quarter note adding some variety to the structure. 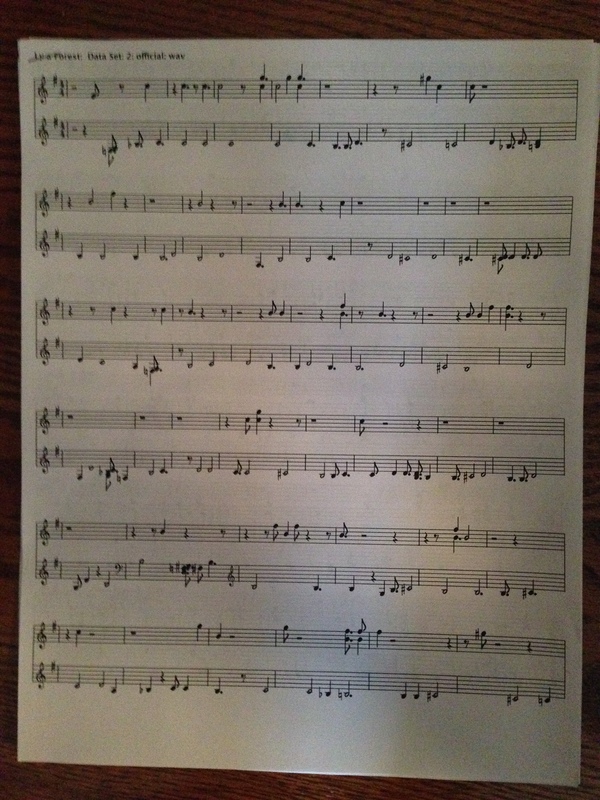 The sheet music generator I used put both sets in the key of G Major, with many sharps and flats along the way. The sheet music generator also added notes to create harmony which I believe I will be taking out later. My process to create the sheet music is as follows: first I converted the zip files exported directly from CodePen to wav files, next I converted the wav files to Midi files (this was the hard part), and finally I imported the Midi files into the Midi sheet music program and procured sheet music. The Midi sheet music program has many ways to alter the music built into its system including changing the note length, the time signature, and the key signature as well as overlaying tracks. I am very excited to do some experimenting and see what I am able to create. One of the most interesting parts of the project so far has been the experience of learning how to deal with complications and problems that arise. As I have written about many times before, I believe my ability to ask for help is my most valuable tool. However, when all else fails, I have found that all there is left to do is to continue to try. I have learned the value of creativity in research as this is the driving force behind one’s ability to continue on. The ability to approach a problem from different angles until one of them finally holds the key to the problem’s solution. Weeks like this make me feel like the sky is the limit. Until next time, to infinity, and beyond! This entry was posted in Uncategorized and tagged independant seminar, ly-a forest, music composition, sheet music, Westtown on May 1, 2014 by annekatherineb.